If you’re looking for information about a car credit card, you’re in luck! I’ve put together a list since I couldn’t find a good resource anywhere else. I’ve written about a few of these before so I’ve linked to my write-ups where applicable. 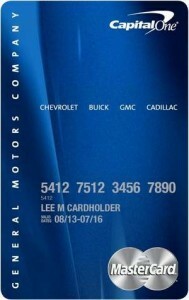 GM credit card: The most famous of the car credit card genre! You get 5% back on your first $5,000 every year to be used toward the purchase of a GM card and 2% back on everything else. It’s actually one of the more generous rewards card out there, but only if you’re a GM loyalist. Earnings do not expire and unlike in years past, there are no limits on redemptions. GM will occasionally top off your earnings too. Note that there is also a GM business card which earns 3% back at gas stations, restaurants, and office supply stores. Mercedes Amex: There are two co-branded Amexes. The lower-end product has an annual fee of $95 and gets you a $500 certificate toward the lease or purchase of a new Mercedes if you spend more than $5,000 in a year on the card. The higher-end product–the most expensive car credit card you’ll fine–has an annual fee of $475 and is essentially a Platinum Amex with the Mercedes logo on it, though it does give you $1,000 toward a new Benz. Note that the Platinum comes with a 50,000-point sign-up bonus; Amex has been known to offer bonuses of 75K and 100K on the Platinum, and even 150K for the business version, so if you’re after points you should take that into consideration. More generally speaking, either one of these cards (or possibly both at once) would be useful if you have a Mercedes purchase or lease coming up in the next year. If you don’t, look elsewhere. 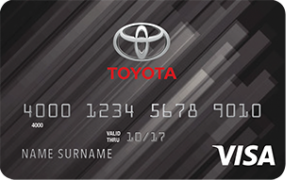 Lexus credit card / Toyota credit card: Essentially the same cards, these are offered by Comenity Bank–see my review here. In a nutshell, they give you five points per dollar at the dealer, two points on gas and entertainment, and one point on everything else. Your baseline should always be a 2% cashback card such as the Fidelity Amex or the Citi DoubleCash, so compared to those this card leaves a lot to be desired. Don’t let the desire for an automobile credit card blind you to the money you’d be passing up with a simple cashback card! BMW Visa: There are actually three versions of this particular car credit card. The vast majority of you would be better off with a 2% cashback card than with any of the three versions, but there’s a bit of a loophole with the VIP version of this card. Long story short, anybody who spends a lot of money on auto supplies–any auto supplies, not just BMW–should read my review here. Chrysler MasterCard Credit Card: This card, offered by First National Bank, is really lame, even for an automobile credit card–avoid at all costs! See my review here if you’re curious. You get three points per dollar spent at Chrysler dealership, 2 points per dollar spent on travel, and one point on all other spending. Stick with your 2% cashback card. Ford Service Credit Card: Note that this is not a MasterCard/Visa type of card; it can only be used at Ford Dealerships. That said, if you spend a decent amount at Ford dealerships and you always pay your bill in full, this could be a good car credit card to have, as it offers a $25 rebate on every purchase of $250 or more. Would asking the dealer to break up a large purchase into transactions of $250 get you multiple rebates? I don’t know, but it’s worth a try. CarCareONE: This is a financing vehicle offered in a multitude of outlets by Synchrony Bank. Be wary of signing up for things like this on impulse; retail outlets get paid for every sign-up and do not have your best interest in mind. If you absolutely do have to go into debt to pay for car repairs, try to do so with a card that has a 0% APR introductory period on purchases so that you don’t waste money on interest. Honda credit card: This was formerly issued by Chase, but there is not currently a Honda credit card at this time. Not for cars, anyway–though you can get credit for a Honda motorcycle here. Subaru credit card: This automobile credit card also was formerly issued by Chase but now is no longer in existence. Audi credit card: Would it surprise you to learn that Chase used to issue a credit card for Audi but no longer does? Hyundai credit card: There is indeed a Hyundai car credit card–in the Philippines. And in South Korea, of course. If you’re in the United States, it’s not available. Jaguar credit card: The Philippines also has a Jaguar credit card for some reason. We don’t. Nissan credit card: No Nissan card, sorry. Volkswagen Visa credit card: This hasn’t been offered for many, many years. Sorry.